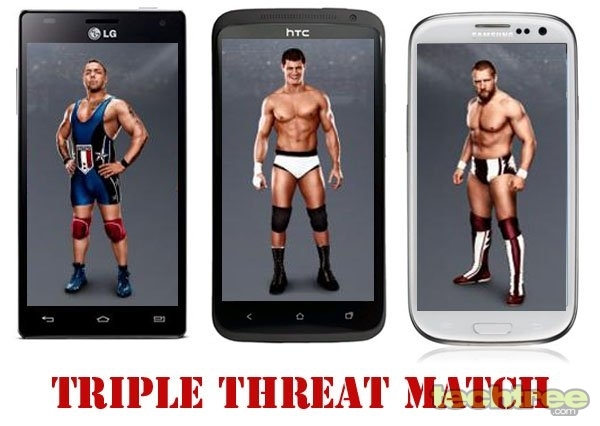 Three quad-core heavyweights enter the ring, but who will be left standing? We have already reviewed the HTC One X, Samsung GALAXY S III (GS3), and LG's Optimus 4X HD. Now what's better than pitting these beasts against each other? After seeing how much our readers enjoyed flaming us (and each other) in our previous Superphone Grudge Match, we decided to hold another such event, and making it more fun by throwing three heavyweights into the ring. The aim is to help Android fanboys (with deep pockets) choose the ultimate handset without having to go through three individual reviews. In this comparison, the winner of each round will be awarded 3 points, while the first and second runners-up will receive 2 and 1 points respectively. Let the battle begin! Undoubtedly, HTC has produced one of the better-looking phones in the Android camp. Its unibody construction makes Samsung's GS3 look positively flimsy. While the 4X HD's design is also good, it's certainly not as impressive as the One X. Therefore, HTC's flagship phone wins this round, while the 4X HD comes second. The HTC One X Wins! On paper, all three handsets look equally impressive. However, in the real world, the Exynos 4212 powered GS3 shatters its competition. Since the One X and 4X HD both use the same Tegra 3 chipset, you'd expect them tie for the second place. However, thanks to the better software optimisation, the 4X HD beats HTC's flagship phone. While these phones have a similar set of features, Samsung takes the lead with its Super AMOLED screen. Moreover, the GS3 has a bunch of software features, including S-Voice (voice assistant) and Smart Stay (the screen remains on as long as it detects your presence). Since there's very little to separate the One X and 4X HD, they're tied for second place. As mentioned in the review, the 4X HD's camera was a real disappointment. On the other hand, the GS3 and One X's snappers are incredibly fast and feature-packed. If I have to choose between the two though, I'll go for the GS3 due to its better image quality. The GS3 and One X are priced at around Rs 38,000 and Rs 36,000 respectively. This makes LG's 4X HD (Rs 33,000) the cheapest quad-core phone in the market. Therefore, it deserves the top spot in this round. Considering the GS3's performance and impressive display, it's also fairly priced. On the other hand, the One X's performance (or lack thereof) fails to justify its price tag. The Winner: Samsung GALAXY S III! As you can see from the scores, even after being the most good-looking phone of the lot, the One X had to narrowly settle for third place due to its lacklustre performance. On the other hand, While LG's 4X HD didn't win too many rounds, it consistently placed second in most rounds, earning it the overall runner-up's place. The GS3 dominated the ring with its winning combination of performance and features. Even though it was let down by its cheap looks, it came out firing on all four CPUs in most of the other rounds to comfortably bag the first place, a spot it well deserves. Gentlemen and lady (since there are practically no girl techies around), please put your hands together for the new King Of The Ring — the Samsung GALAXY S III! One X fanboys, you may now proceed with your flaming!